Mastery in 1 week instead of 2! 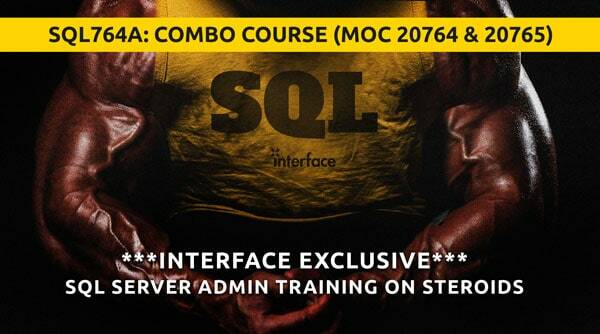 This 5-day Interface-exclusive instructor-led course, combines the material from two Microsoft Official courses – 20764 and 20765. Students who administer and maintain SQL Server databases will gain mastery implementing SQL Server in an on-premise configuration. 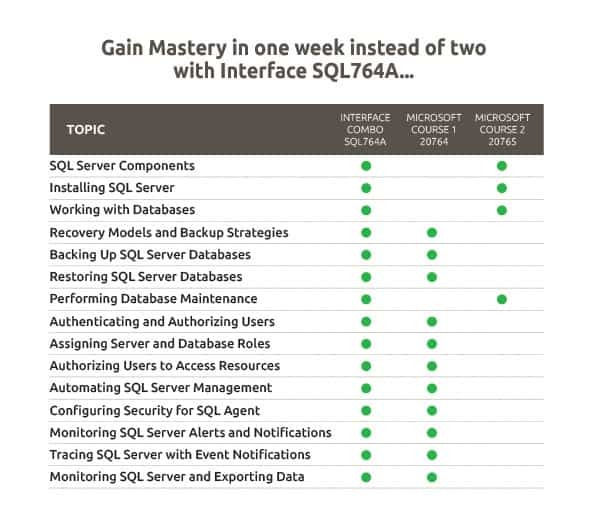 Students who develop applications that deliver content from SQL Server databases, or are responsible for managing development instances will gain mastery in how to manage a SQL Server instance. This module introduces the SQL Server 2016 platform. It describes the components, editions, and versions of SQL Server 2016, and the tasks that a database administration commonly performs to configure and SQL Server instance. One of the key responsibilities of database administrator is to provision databases and server. This includes planning and performing the installation of SQL Server on a physical servers and virtual machines. This module explains how to assess resource requirements for SQL Server 2016 and how to install it. In this module, you will consider how to create a strategy that is aligned with organizational needs, based on the available backup models, and the role of the transaction logs in maintaining database consistency. In this module, you will learn how to implement various backup strategies using the SQL Server backup commands. Protection of data within your SQL Server databases is essential and requires a working knowledge of the issues and SQL Server security features. This module describes SQL Server security models, logins, users, partially contained databases, and cross-server authorization. Microsoft SQL Server includes support for security roles defined at server level and at database level. This module covers fixed server roles, user-defined server roles, fixed database roles, and user-defined roles. In this module, you will see how these object permissions are managed. In addition to access permissions on database objects, SQL Server provides the ability to determine which users can execute code, such as stored procedures and functions. It is important to understand how to create a minimal privilege security environment for jobs that run inside SQL Server Agent. This module describes the considerations for SQL Server Agent security, including proxy accounts and credentials. This module covers the configuration of Database Mail, alerts, and notifications for a SQL Server instance. The primary audience for this course are individuals who administer and maintain on premise SQL Server databases. These individuals perform database administration and maintenance as their primary area of responsibility, or work in environments where databases play a key role in their primary job. "Great instruction and use of the tools available (smartboard, file shares, etc)." "Was impressed with training content and got a lot of useful information that can use in real world applications." "Peter was very knowledgeable and thorough in teaching with great presentation skills that made the course fun/interesting." "This is my second class with Peter. He is knowledgeable and he makes sure that the class understands each topic before continuing to the next one. He is an excellent instructor."